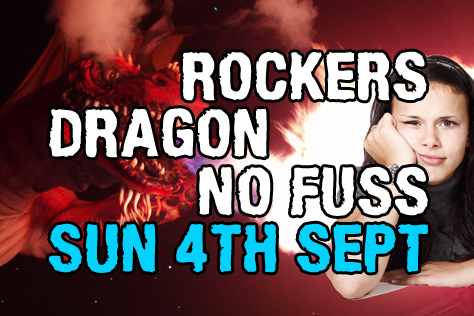 This Sunday (4th September) sees the Brighton Rockers hosting an epic double header at the Dolphin in Haywards Heath. 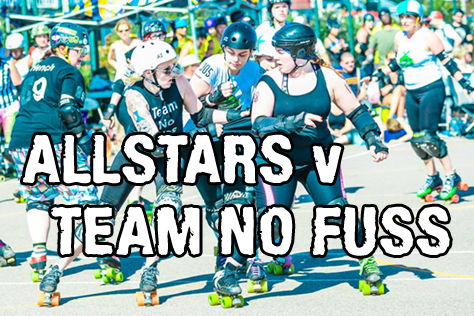 Both Rockers sides will be facing challenge teams composed of skaters from various different home leagues. The A-team AllStars are facing a super tough Team No Fuss roster, whilst the B-team Rockerbillies lock toe-stops with a very different Team Dragon squad to the one that defeated the AllStars at the Dolphin in February of last year. One aspect in which challenge teams differ from home leagues is that Flattrackstats, whilst recording (some) challenge team scores, doesn’t include them in any rankings system. As a result, their computer won’t come up with predicted win percentages or scorelines for games involving challenge sides. So we really have no idea what’s going to happen in the games. You’ll have to pop along to find out! Doors open at 2pm with the A-team game up first at 2.30 and the B-team battle following at around 4.30. Tickets are £10 for adults, £8 students and free for under 12s. Online sales have closed, but tickets will be available on the door. The Dolphin is about seven minutes walk from Haywards Heath station (turn left and follow the signs on lampposts) and Southern have forgotten to have any Sunday engineering works affecting the station this week yay! There’s parking at the leisure centre and a big Sainsbury’s (shuts at 4pm) between the venue and station if you need supplies. You can’t bring in your own booze, but there will be a table selling beer, wine and cider in the hall. The after party takes place at the Star pub at the bottom of Broadway, about 15 mins hike from the leisure centre (walk back past the station and hang a right). Founded by former Bourne Bombshells bench coach (and most recently manager of men’s Team England) Polka Dotty, No Fuss these days includes skaters from across Sussex, Kent, Hampshire, Essex, London and far beyond. This will be the first time a No Fuss team has faced a Brighton side, at least in public. With a huge roster of skaters on their books (70+) it will be interesting to see who takes to the track for No Fuss today. 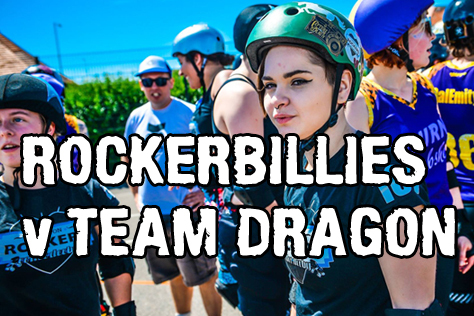 The day’s second game sees the Rockerbillies joined by several skaters from Eastbourne to take on Team Dragon. TD were founded by former London Rollergirls Recreational League bench coach Max Rees. Although Max has since moved to Canada, the team still has LRG rec league skaters at its score. This game is a Brighton swansong for B-team captain Van Hayley, who is transferring to Bristol Roller Derby. This entry was tagged Brighton Rockers, Haywards Heath, Rockerbillies, roller derby, roller skating, sport, Team Dragon, Team No Fuss, women's sport.